Sebastiaan “Bas” Rutten (Dutch pronunciation: [ˈbɑs ˈrʏtə(n)];) is a Dutch retired mixed martial artist (MMA), Karate and Taekwondo blackbelt, and Muay Thai kickboxer. He was a UFC Heavyweight Champion, a three-time King of Pancrase world champion, and finished his career on a 22 fight unbeaten streak (21 wins, 1 draw). 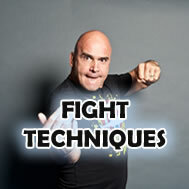 He is currently the star of Punk Payback on Fuel TV and co-host of Inside MMA on AXS.TV. Fight record: 28 wins – 4 losses – 1 draw. 12 wins by KO, 13 by submission only 3 by DEC. Didn’t lose in his last 22 fights. Top wins against Frank Shamrock (on two occasions), Kevin Randleman, Maurice Smith, Masakatsu Funaki, and Guy Metzger. 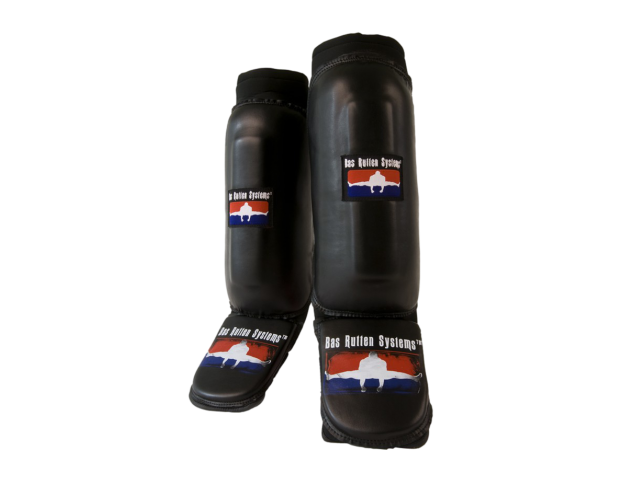 His hybrid style incorporates equally stand up and grappling aspects and the make up of his stand-up system could be described as a combination of Karate, Muay Thai, and Taekwondo. 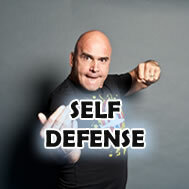 Bas Rutten was born February 24th 1965 at Tilburg in the Netherlands. The young Bas suffered from asthma and also a very bad skin condition and as such he had few childhood friends. He very much enjoyed reading comics like Spiderman and Wolverine, which led to his climbing of trees. He lived near a grass field that had a row of trees and also adjoined a forest. He became a proficient climber being able to move from tree to tree without touching the ground. His climbing extended to the rooftops of houses where he would watch the stars fantasizing about turning into Spiderman or Wolverine. While on holiday with his family in France in 1976 Bas, accompanied by his brother, snuck into a movie theatre that was playing ‘Enter the Dragon’. Bas was captivated by Bruce Lee and the martial arts and this movie begun his lifelong involvement in martial arts. In his own words this was a life-changing experience for the young Bas and immediately on his return to Holland the first thing he did was make up a set of nunchaku from two pieces of wood and some chain. They become an important accessory for the young Bas and he carried them around his neck even to the local grocery store. By now he was an avid movie-goer of Bruce Lee movies, watching his every kick and punch and of course use of the nunchakus and as soon as he got home imitating the moves and practicing them until he got them right. Bas begged his parents constantly to allow him to train in martial arts and after considerable persistence they agreed and he begun training in Taekwondo. He had only been training for about three months and was already beating brown belts in sparring, so his confidence started to build, when accosted by one of the biggest bullies in town and his friends, this time, he did not run or climb to get away but struck the bully with a single punch breaking his nose and knocking him out. He was ecstatic with the result and the life-changing effect martial arts had given him; that is until his parents found out because the police showed up at the front door, this put an end to his use of martial arts in the street. From then on he convinced the bullies that he was a black belt and if confronted would deter them with his controlled skill in true Bruce Lee like manner he would extend a sidekick holding his foot directly in front of their face. By now he had moved on to a new school and although he still had the severe skin disease and had to wear gloves that led to him being less than popular, he had made friends with other students that were also accustomed to being bullied and ridiculed. They stuck together and become known amongst each other as ‘The Champions’, and looking back Bas laughs and comments what a name for a bunch of wannabes but it worked for them at the time. One of the group, the over weight one, began boxing and proved pretty good at it passing on pointers to the keen learner Bas. Strength by association and the numbers and where, as individuals, his new friends may not have fought back before now when singled out for some adverse attention they would initiate the action. At age 20 Bas left home to live with his girlfriend and this was a point in his life where he really become involved and committed to martial arts training. For starters it was karate and Taekwondo and then moving on to Thai boxing. Everything started to happen so fast from training to fighting in Thai boxing and maintaining an undefeated record and beginning work as a bouncer which in turn put his ring fighting on hold as he was working most nights. The next four years he worked as a bouncer and partied, that is until one New Year’s Eve he was asked if he would take a fight against Frank Lobman. Before he knew it the fight was being promoted and Bas could not really even remember his New Year’s Eve agreement to take the fight against a fighter that was at the top of his game with no losses and a 90% knockout rate. This opponent would be tough and had just been released from prison and was ready and wanted to fight. On the other hand Bas had been partying hard and was out of serious training with working the doors. When they called him to ask where they had to send “the posters” to, he said “What posters?”, they said from the fight. He said “what fight?”, YOU! “When?”, in three and a half weeks….. When his memory was jogged of accepting the New Year’s Eve offer and he was asked if the fight was still on he simply replied, “Let’s try it.” So the first thing was to decide on where to train and Bas chose Maeng Ho in Holland as this was where Ramon Dekker trained, a fighter he had always admired. He quickly realized after the first session that he was way out of condition as completing skipping sets a real challenge and realistically should have started training for such a fight much earlier. The end result was a hard lesson as he lost this, his come back bout. His next encounter against an up-and-coming fighter, Renee Roze, started well for Bas with him dominating the first round. However in the second round his opponent bit clean through his ear and would not release the bite even after Bas warned him. The situation required immediate action in the form of a full power knee to the groin, which led to a full on brawl outside the ring between both fighters’ supporters that were made up of mainly bouncers. Bas saw the funny side of this observing all the outer ring action from inside the ring while he was sitting in a chair that was thrown in the ring, bounced on Bas’s trainer, Cor Hemmer’s back, and landed behind Bas. His next fight was against a French fighter that he trained very hard for but unfortunately as life would have it the week before the fight Bas got an infection and on top of that was involved in street fight and spent two days in police custody and was only released two days before the fight. Being the fighter he is Bas took the fight and in the first round knocked his opponent down three times once with what the officials called an illegal blow, a back fist, which was a new rule to Bas. The effects of his medication for the infection he was suffering were overwhelming and at the beginning of round two being tight-chested with real breathing difficulties he could not continue. After this fight the armchair experts were starting to say that he could not fight even though he had won 14 fights by KO and this annoyed him to the point he did not want to fight again in Holland and entertain those with no idea of the fight game. Frustrated with the fight game but still with the burning desire to keep practicing martial arts he decided to focus his attention on martial arts to music, so along with his friend the focus was on martial art shows set to music with the shows rising in popularity to the point where they were featured on television. 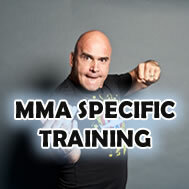 The training was in Amsterdam about 80 miles away from where he lived and at the first training session Bas was repeatedly choked by a class full of little guys that he thought he could resist. This resulted in a very tender throat and the inability to eat for several days. “I had to drink liquid food”, Bas said. The training session was so intense that Bas stopped his car on the roadside on the way home phoned his wife and told her that he was so tired he would sleep in the car on the road side. His wife asked him, laughing, when he arrived home the following day if he intended to return and he replied “I intend to tap out those that tapped me out within three months”. Bas improved his submission skills even though finding training time was difficult between his bouncing work, instructing and the 80 miles travel required to train at Amsterdam. Several months later Chris Dolman contacted Bas regarding the Pancrase organizers, Funaki and Suzuki, who were visiting and looking for fighters to compete in Japan in a new organization called Pancrase, Bas had to show up THAT night at his gym for a try out. Bas went and met with them and they watched him training and sparring with a big-name Dutch fighter who tried his utmost to hurt him. Bas kicked him in the head and he was off to hospital to get his eyebrow stitched, which done it for the Japanese confirming they wanted him to fight in Japan. Japan, September 21, 1993, a day he will not forget, as his opponent was 45 pounds heavier and unbeknown to him the bout was one round of 30 minutes over the usual kickboxing five times three-minute rounds he was accustomed to. Bas tried not to show his concern at the 30 minute round by saying, “that will be okay as I’m in shape.” Deep down he thought, “Oh my god, 30 minutes! What would happen if I tried to KO him early, being the aggressive fighter I am, and he survived with over 25 minutes to go and I gassed. I would get killed!” To ensure this did not happen he put two R’s on his hands which in Dutch was short for “rustig”, and by coincidence also starts with an “R” and means “relax” in English. In his corner was his former manager and good friend Clovis Deprets, and he instructed Bas that when he got hit he was not to lose his temper and go berserk but was to keep calm and cool. The fight was over in 43 seconds, a win to Bas by KO. Ecstatic happiness took over and Bas executed a split kick to each corner of the ring and they became his trademark along with the letter R on his hands. 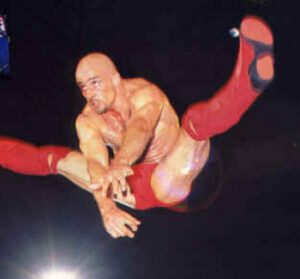 This is how the trademark ‘Rutten Jump’ was born.